Here’s a great way of kick-starting your business for the New Year. 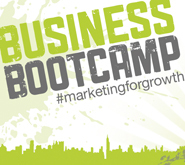 At our #Marketing-for-growth Business Bootcamp, you’ll get a couple of hours of high impact Marketing Workouts, designed specifically for business growth. PLUS, you’ll learn some great tricks of the trade that we’ve worked out over the years (perhaps too many to mention! ), that…. Don’t worry, its nothing too gruelling! Just a great way of getting your business into shape for 2016 with a couple of hours of high impact Marketing Workouts, designed specifically for business growth. PLUS, you’ll be able to pick up the tricks of the trade that we’ve worked out over the years (perhaps too many….